This concept video is all about making money with baby pairs in Texas Hold'em cash games. Baby pairs, "small pocket pairs" or just "small pairs" refer to the lowest group of pocket-pair starting hands in Texas Hold'em, usually ranging from 22 to 66. Despite being attractive preflop, small pocket pairs are notorious for causing problems postflop, forcing even the experienced players in to making unprofitable decisions. SplitSuit's aim in this strategy video is to highlight how you can make money with these small pocket pairs, covering both preflop strategy and postflop strategy. There are also frequent mentions of the most common mistakes made by beginner players when dealing with small pairs throughout the course of the video. How to set mine profitably + a general rule of thumb for cold calling different bet sizes preflop. When to open with baby pairs. The value of 3betting with small pocket pairs preflop. How to play pocket pairs postflop when you hit your set. How to play pocket pairs postflop when you miss your set. 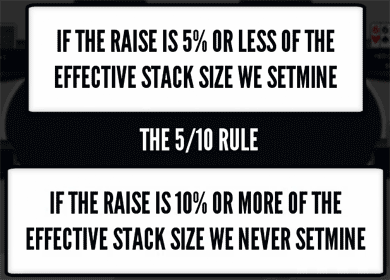 The 5/10 rule for set mining with pocket pairs. Starts at 7:16.